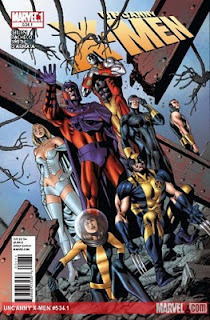 April kicks off with the Uncanny X-Men #534.1! I have to admit, I was getting more and more excited for this issue. I kept hearing great things from previews and it sounded like this was going to be a great book to bring back lapsed readers. Uncanny X-Men #534.1 is being promoted as the Magneto issue because in this issue, we see how the X-Men are trying to get ready to let the world know that Magneto is now a good guy. Magneto sits and talks with their PR person about how to let the world know, while the rest of the X-Men try to stop an A.I.M. manufactured earthquake. As we see the minutes tick by between the two stories, we get to see Magneto admit his true feelings about his past and that he really does like to be feared. Despite the fact he didn't destroy New York, he knows that he could have without a second thought. But as the seconds tick by and the earthquake becomes inevitable, Magento steps up and saves San Francisco, and all of those humans, from destruction. Kieron Gillen really put a lot of thought into his first issue. As the start of a new story / jumping on point, it was incredibly laid out. This issue had two storylines going on, with Magneto covering past info for newbies like me, while the rest of the X-Men built up a new storyline. I also really appreciated the place, person and time updates when the panels changed. It helped bring cohesion to the two stories. This was a fantastic Point One issue that really captured my interest from the start. There was a good amount of background info that wasn't delivered obviously, and the story has a definite path to continue on. I definitely did not do this justice in summary; you need to go buy it now! I would recommend this to new and lapsed readers because I think that Gillen will bring a great story to the Uncanny X-Men.